The Dawgs put a boatload of players on the field in Saturday's win over Georgia Southern, 70 by my count (including non-scholarship players), although I probably missed a few. 11 of those players were true freshmen, the most that Mark Richt has debuted in a season opener since 2002. There are 2 ways to look at true freshmen seeing the field in the season debut. #1 - They are so good you can't keep them off the field, and #2 - You have to play them because you don't have anybody else. In the case of teams like Georgia, #1 is certainly the case. Georgia, Southern Cal, Ohio State, Oklahoma, LSU....these programs don't have to play true freshmen out of necessity, except perhaps when an injury at a rare thin position requires it. 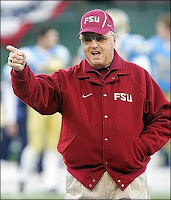 Bobby Bowden used to loathe playing true freshmen, saying that you could expect a key mistake at least some point in the season from every true freshman you have to play. These days, the aforementioned programs do their best to make sure that not too many true freshmen they do play are not on the field for too many of those "key points in the season." While that certainly will be the case for a few of the freshman that Mark Richt chose to play against Georgia Southern, the simple fact is that a good number of players in this group are going to be keys for the Dawgs to achieve what we're all hoping for. With that, here's a look back at the true freshmen that played Saturday, followed by some analysis of who we might still see this Saturday or at some point between now and the end of the season. Glenn was the 5th true freshman (not including special teams) to start a season opener under Richt, joining Kedric Golston (2002), Danny Ware (2004), Trinton Sturdivant (2007), and Bruce Figgins (2007.) Glenn had a pretty good day, making very few noticeable mistakes. While he had an outstanding fall camp, easily the most surprisingly impressive of any of the incoming freshman, the fact that he started game 1 of the season doesn't mean he's locked in for the rest of the year. The Sturdivant injury prior to the season, combined with Clint Boling's suspension, forced the UGA coaches to scramble people around, and probably rushed Glenn into a little more action than they may have wanted. But no doubt he would have played regardless, and perhaps even started. In the post-game, Richt confirmed that with the return of Boling for the Central Michigan game, Glenn, Boling, Justin Anderson and Ben Harden will compete for 2 starting jobs at right guard and right tackle. Glenn is going to be a great one for the Dawgs, and is critical to UGA's depth along the offensive line, in particular due to his ability to play both guard and tackle. Walsh got the season off on the right foot, putting UGA's season in play by booting the opening kickoff 8 yards deep in the endzone for a touchback. 6 and a half minutes later he was scoring his first points for the Dawgs, with a 52 yard field goal, the 3rd longest in history by a UGA freshman (Hap Hines in 1996 and Allan Leavitt in 1973 both hit 54 yarders.) His leg strength is undeniable. I was sitting in the northwest corner of the stadium and had a great view of the kick, and it would have been good from 60 easily. Kevin Butler made the comment in the post-game radio show, that he fully expects his record of 60 yards to be broken at some point in the next 4 years. The only thing that still remains to be seen is how Walsh will do it when the pressure is on in a big-time SEC game. After the opening kickoff, it appeared that he was simply doing what he was being told to do by the coaching staff, with the customary directional coverage kick, and he looked pretty good doing it as well. He was also a perfect 6 for 6 on extra point attempts, and even recorded a special teams tackle. So far, so good. 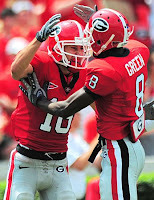 Green had the stadium buzzing when he trotted onto the Sanford Stadium field for the first time Saturday. 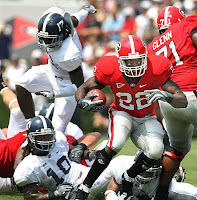 Immediately after entering the game in the first quarter, Matthew Stafford hit Green for a 36 yard gain that set up Georgia's first score of the season on Knowshon Moreno's 2 yard touchdown run. He'd later make a terrific catch on a fade from Joe Cox in the 4th quarter for his first career touchdown. Quite frankly, that play looks damn near unstoppable to me. I expect to see opponents eventually start keying their defense on it, whether that means double-teaming or perhaps getting a bit physical with A.J. when he lines up wide when the Dawgs are in the red zone. UGA quarterbacks looked toward him 3 times in all, and he caught 2 of them for 40 yards and a touchdown. An impressive debut for Green, but by no means the last flashes of brilliance we'll see. King saw his first action as a Bulldawg early in the game, entering in the first quarter. While he didn't catch a pass (nor was he thrown to that I recall), his early entry into the game signals that he is very much in the rotation at receiver. His production will increase dramatically as he gets more comfortable in UGA's system. Maybe the biggest surprise of the entire day for the Dawgs, getting credit for 3 tackles, although it seemed like he when he was in the game, he found his way to the ball on just about every play. He had his first career sack negated thanks to an offsides penalty. I'm no coach, nor have I ever been one, but to me he looks as technically sound as any freshman linebacker I've seen. He seems to float to the ball. With his frame, you expect him to put on some weight as his career progresses, but I don't think there is any doubt that he stands a good chance to be a major contributor the rest of this season. Dowtin is a stud. Samuel confirmed the rumors that he had passed Caleb King as the 2nd-string tailback this preseason, when he got his first official carry as a Bulldawg at about the 3:00 mark of the 1st quarter. Unfortunately, he got a little too excited and fumbled for the Dawgs' lone turnover on the day. He'd end his debut with a nice 6 carries for 34 yards, including two runs of over 10 yards. He was more than likely passed by King, who was slightly more impressive ending the day with 12 carries for 95 yards. My first observation is that he runs a little bit "out of control", and maybe slightly upright. That said, I love the way he hits the hole, and he definitely passes the eye test in pads. King looks a little more polished at this point in their respective careers, but Samuel is clearly a great talent. It is easy to see why he's out there. Given that he didn't enter the game until after the unfortunate season-ending injury that Jeff Owens suffered, one might think the coaches decided to burn Tyson's redshirt only after the injury occurred. I'm not so sure he wasn't going to play anyway. I'm pretty sure he entered the game during the same drive that Owens was injured on, so it would have been a pretty quick decision to burn his redshirt so quickly, without knowing for sure the extent of Owens' injury. The Dawgs were already a little thin on experience at tackle due to Kade Weston's knee problems. Tyson had a pretty good game, recording 2 tackles, including one for a loss. Geno Atkins and Corvey Irvin will start at tackle against Central Michigan, but Tyson will have every chance to increase his playing time, with Weston out for at least another week. From there on out, he'll continue to battle Ricardo Crawford and Brandon Wood for time in the rotation. No surprise to see Boykin get his first action against Georgia Southern. The UGA coaches gushed over him throughout fall camp. The first thing I noticed was that he looked awfully small out there compared to the other UGA cornerbacks save maybe Ramarcus Brown. The second thing I noticed is that he is extremely quick. Dripping with potential. Often times he looked a little lost, with his fellow cornerbacks having to show him where to be on the field, but nothing unexpected there. He finished the day with 2 credited tackles. He looks to be the 4th cornerback in the rotation right now, and should continue to see increased playing time as the season progresses. Jones is listed as the firm 2nd-string center on the depth chart, but in all actuality he is probably 1B. I didn't catch an exact total of snaps played, but I'd guess Davis played just slightly more than Jones. He did not disappoint in his first game in Athens, and he'll do nothing but get better as we move forward. Williams may have been the biggest surprise among the freshman that saw the field Saturday, although Richt mentioned him as a possibility earlier in the week. He saw his first action on special teams, covering a kickoff in the 3rd quarter. Unfortunately, his first play also resulted in a 15 yard personal foul penalty as he got to the GSU return man just after Darryl Gamble had already put him down. Personally I thought it was a questionable call. (Poor Nick looked like he just wanted to crawl off the field without any of the UGA coaching staff noticing him.) I didn't notice him getting back into the game, but I may have been wrong on that. Expect to see him get increased playing time on kickoff coverage at first, as well as some limited time at safety as we get into the latter half of the season. I expected to see Commings in the game given the work that he got with the 1st team defense at times during fall camp. To be honest, I never noticed him against Georgia Southern. Based on what some people told me, he was in the game on UGA's last defensive series. The official UGA game notes list him as having played, although he didn't record any official stats. (It should be noted that those notes did not list Nick Williams, and a number of media outlets didn't list Tavarres King as having played.) Commings is expected to contribute all season at cornerback, and can also fill-in at safety based on depth, and on special teams if needed. -I thought for sure that Carlton Thomas and Dontavious Jackson would both see time, or at least that one of them would. Turns out neither did. I saw both wearing helmets on the front row of the UGA sideline during a few UGA offensive series', so I doubt very seriously that either knew for sure that he wouldn't play in the game. I'm especially surprised that we didn't see Thomas return a punt at some point in the 2nd half when the game wasn't in doubt. I still don't think it is a given that either or both of these guys won't see the field this year. -Makiri Pugh didn't dress out Saturday due to injury, but it looks like he'll return to practice this week. When he was healthy in fall camp, he was impressive. If he's picked up enough of the gameplan along the way, we may still see him on the field on Saturdays at cornerback. -Willie Martinez has constantly mentioned Bacarri Rambo in the same breath with Pugh, Williams, Commings and Boykin in the secondary. He was clear from the start that some of the members of that group would see playing time earlier than others, but that he wasn't closing the door on all of them seeing the field by mid-season. -A.J. Harmon is a major X-factor at this point. Conventional wisdom is that he redshirts. The coaching staff has inferred that at 330 lbs, they'd prefer to wait another year before deciding whether or not he is an offensive guard or a defensive tackle. That said, with one more injury at defensive tackle combined with Weston's knee issues being worse than originally thought, they may have to re-think things. Barring injury, Harmon is a certain redshirt. -Christian Robinson and Cornelius Washington were both mentioned among possible players that might see time this season, but given their absence against Georgia Southern, it seems likely that they are headed for redshirts at this point. To summarize, we saw 11 true freshman on the field Saturday, and I'm betting we'll see at least 3 more out there before mid-season. If so, that would make 14 of 21 incoming freshman that will play during their first year. Unheard of in past seasons Between the Hedges, but more than likely will be the norm in Athens in future years. Great thoughts. Thank you for consistently providing some good fan commentary (good information & insight, but not nuanced like a lot of newspaper writing...hope that makes sense). Thanks also for the countdown...it really helped me through the lean times. Yes, Nick did play. Personal foul penalty on a late hit during a 2nd half kickoff return. Like I said in the blog, I don't know if he played again after that. I was watching closely and never saw him back in there. First-Time Starters: There have been 13 true freshman starters in the season opener dating back to the Vince Dooley era (1964). The true freshman starters under Mark Richt are Cordy Glenn (RG - 2008) and Blair Walsh (PK-2008), Kedric Golston (DT - 2002), Danny Ware (TB - 2004), Trinton Sturdivant (LT - 2007) and Bruce Figgins (TE - 2007). The Bulldogs had 10 true freshmen play in Saturday's win over the Eagles, which is the most true freshmen who have played in a season opener under Richt. The 10 freshmen were Nick Williams (DB), Brandon Boykin (DB), Richard Samuel (TB), Marcus Dowtin (LB), Blair Walsh (PK), Ben Jones (C), Cordy Glenn (RG), DeAngelo Tyson (DT), Sanders Commings (DB) and A.J. Green (FLK). The previous high under Richt was nine 2002.
on a sidenote , what song did they play at beginning of 3rd quarter? it was rap song and the guys started dancing a little. i can only assume it was a small preview of whats to come at future home games. like last years Soulja boy. Anyone have any info on that? By the latter part of the season especially, playing all those true freshmen will prove to be a great decision. They will be more valuable to us now than they would have been in their 5th year. We haven't always been able to say that. Anonymous....please read the post I put up just now titled "a few week 1 thoughts." You know if you posted under a name, it just might force you to be remotely accurate. Seriously, you just read that whole thing (very well done post imo) and that's what you comment??? lol.